Melt the white chocolate over a double boiler (or in 30-second intervals in the microwave on 50% power, stirring after each). Once the chocolate is melted, remove from the heat and let sit for a few minutes to cool slightly, stirring occasionally. Add the mint extract, if using, and stir to combine. Add a few drops of green food coloring and stir until desired color is reached. Spread the white chocolate mixture onto the prepared pan in an even layer (depending on the size of the pan and how thick you’d like your bark, you may not need the entire surface of the pan). Refrigerate for 15 minutes, until just about set. Meanwhile, melt the semisweet chocolate over a double boiler (or in 30-second intervals in the microwave on 50% power, stirring after each). Once the chocolate is melted, remove from the heat and let sit for a few minutes to cool slightly, stirring occasionally. Pour over the white chocolate layer and spread evenly over top. 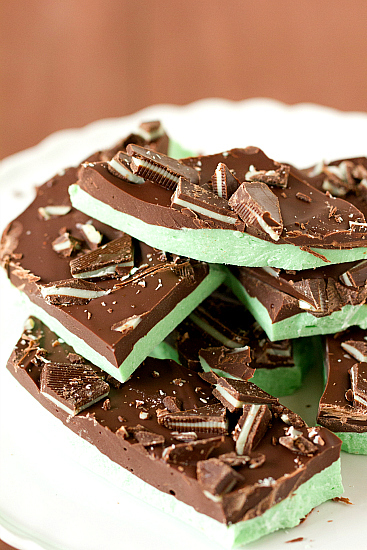 Sprinkle with the chopped Andes mints and press down lightly to push the mints into the top chocolate layer. Refrigerate for at least 30 minutes, until completely set. Cut the bark or break into uneven pieces. Store in an airtight container at room temperature or in the refrigerator. When stored in the refrigerator, it will keep for at least 2 weeks.